recommended: modelling clay/bluetac/playdough etc to stick the acorns in to dry. To make holding and painting the acorns easier I stuck them onto some snack picks. They were harder to pierce than expected so some I had to pierce with something sharper first so as not to snap the picks. Rather than using small brushes (which you could use instead) we painted using the picks. This made it even more fun, different and interesting for us. Generally we stuck the eyes on first and then painted the rest. It was delightful to see the concentration in Maddie's face as she created. I couldn't resist making a glitter one. Stick them into your modelling clay to dry, display and play. Make some Acorn Buddies and hats today. 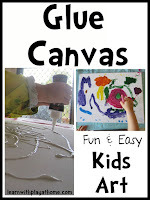 - Simplify this activity by using a small brush to paint with. For little kids, just sticking on eyes will be challenging enough. You could drop the acorns into different coloured paint and roll them around before sticking on eyes. Have children make up a story using their Acorn Buddies. - Use new language and descriptive words like, "miniature", "concentration", "decorate" "embellish" etc. This will help with their language development. 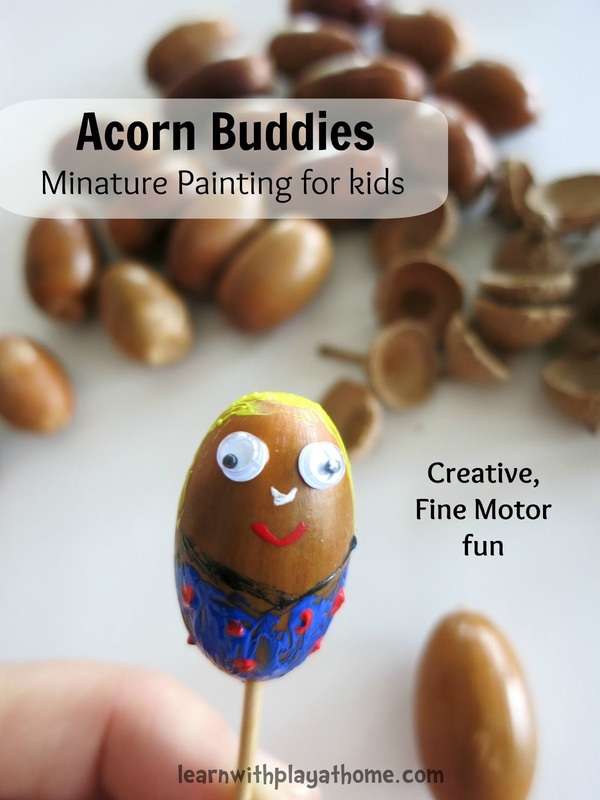 - Check out this post from Picklebums on the importance of collecting things with kids and for some more fun acorn ideas. - Use the acorn caps on some gorgeous peg dolls like Happy Whimsical Hearts did. - Or set up a gorgeous Autumn themed invitation to draw like An Everyday Story. - Still feeling creative? Here are some of our other creative ideas for kids. I think we need to go collect even more acorns because when my kids see this they will HAVE to do it! Wow they look amazing!! I love hey they have little hats as well, so so cute!! My girls would love this. These are just so cute...and I love the concentration on Maddie's face...what a wonderful activity for her to really become engrossed in! What gorgeous little characters and you captured such special moments of Maddie creating her adorable acorn buddies. Elise @ Creative Play Central. Nawww, I love these! Sooo Cute, Gumnut babies, huh! Acorn babies, that's what I first thought when I saw them! How did you get acorns? I want some! I absolutely love this. The concentration and fine work your little girl is doing during this activity highlights the great learning that is achieved in doing such a fun task. The little decorated acorns look adorable and all children love petite things. Oh my how cute. Such a great way to practice hand eye coordination and fine motor skills. So fun! My year one students would love this and probably spend all day doing it!